Moving from Silicon Valley back to the eighth most populated city in Canada isn’t the series of events that most tech entrepreneurs dream of, but after raising $15 million in venture capital, you won’t hear any complaints from Trulioo Founder and CEO, Stephen Ufford. This December 2015 marked American Express’ investment in his global identity verification business, a first for the multinational financial services corporation, and combined with existing investors BDC Capital, Blumberg Capital and Tenfore Holdings, was the largest financial technology financing of 2015 in Canada. Trulioo provides instant global ID verification for four billion consumers in over 40 countries. The company’s solution, GlobalGateway, serves a wide range of industries, including finance, banking, retail, payments and online marketplaces. The business, founded by Stephen and his partner, Tanis Jorge, is now positioned to take on the global banking space. There’s no doubt that Stephen is one of Vancouver’s tech leaders, which is why we sought him out to be the subject of one of Small Business BC’s first Industry Influencer features. This series of 10 minute interviews will interview the best and brightest entrepreneurs who took their BC businesses big, or are innovating their industries so fast that they cannot be ignored. Insight into their journey from start-up to success will offer you invaluable inspiration and wisdom from entrepreneurs who have experienced the struggles of local small business first-hand. We’ve asked Stephen a few questions about himself, his work and his business here. What do you think is essential for start-ups and small businesses to know, especially within the tech industry? Hollywood loves to portray startup life on sitcoms and movies as a glamorous work environment with fancy cafeterias, state-of-the-art media rooms, and personal stylists, but this portrayal is extreme and exaggerated for most start-ups. With that said, it is important to find the right balance between maintaining a lean, bootstrap start-up and becoming Ebenezer Scrooge. Spend your money wisely by clearly defining expenses, making sure your leadership leads by example, and investing in an employee retention strategy. It’s critical for start-ups to keep good people, which means keeping them engaged and feeling appreciated. Where did your inspiration for Trulioo come from? When I moved to the US, I experienced numerous obstacles that prevented me from renting an apartment, opening a bank account, and applying for a credit card. I was frustrated with how challenging it was to prove my identity because my Canadian government-issued ID card was not recognized by financial institutions in the US, which required authentication from a third-party service. I knew my situation was not unique and that it was a problem affecting everyone who has moved or will move to a new country. When I discovered the inner-workings of financial institutions of how they obtain credit scores and ID checks, I instantly realized the inefficiencies of the process and identified the roadblock preventing me from opening a bank account and renting an apartment in a new country – access to data. What was one of your biggest obstacles starting the business? When raising money for my businesses, I realized early on that I needed to have thick skin if I wanted to succeed because I’d probably receive 99 “No’s” before getting my first “Yes!” from an investor. Trulioo has taken some remarkable strides since it was founded in 2010. In fact, a few weeks ago, you raised an outstanding $15 million in funding. Why do you think it has been so successful? The phenomenal team who have dedicated themselves to the success of the company. In addition, the timing of our identity verification service was a critical element to our company’s success. If our solution was introduced earlier, the world wouldn’t have been ready for it, and if it was launched later, the marketplace would have been crowded making it much more difficult to break through the noise. 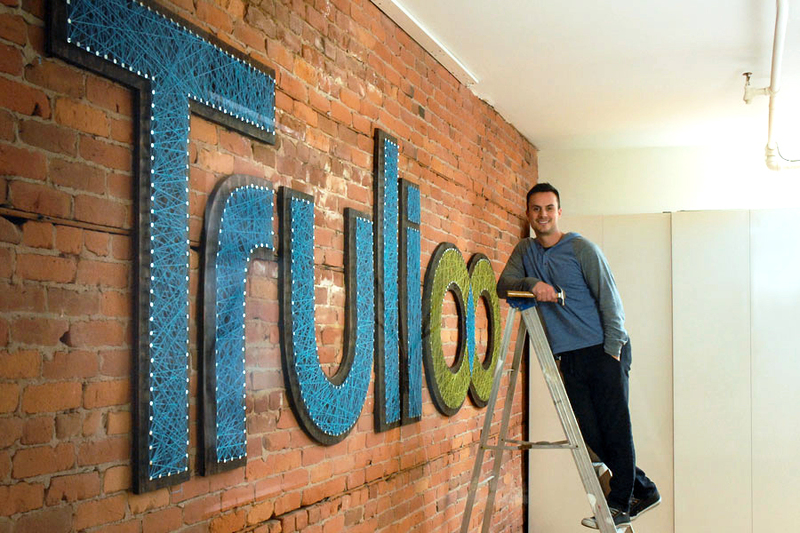 Is there a particular style of leadership that fueled Trulioo’s beginnings and growth? Although it’s nice to have a “plan” in place, it’s just as important to stay nimble so that you can adjust the plan accordingly. Trulioo is a global company. Why did you choose its headquarters to be located in BC? Not only is Vancouver home for me, but it’s also home to a lot of talented and highly skilled professionals from around the globe, thanks to the wonderful lifestyle the city offers. Plus, Canada has the legal framework, expertise and know-how needed to be a global leader in the data-driven economy. With our strict privacy laws and innovative technologies, we are in the best position to help businesses that need access to personally identifiable information (PII) via a safe, secure and highly regulated environment. What drives you as a serial entrepreneur? My passion for solving real problems… My natural instinct is to understand why the problem exists and what processes would need to be put in place to offer an optimal solution to the problem.